Musladin-Lueke Syndrome (MLS) is an inherited disorder affecting Beagles. Dogs with this disorder have increased amounts of Connective Tissue in the skin and joints. Clinical signs are usually noted at birth and include stiff, sometimes contracted joints that cause dogs to walk upright and often on their tip-toes, giving them a “ballerina walk”. Affected dogs are smaller than littermates with creased ears and thick, tight skin. Other features of this disorder include short outer toes, broad flat foreheads with wide-set slanted eyes and high-set ears. Dogs may also exhibit a failure to thrive, have seizures or experience “phantom pains”. Symptoms continue to progress until dogs are about 1 year of age at which time they appear to stabilize. Dogs with this disorder typically have a normal life span, but commonly develop arthritis. The Mutation of the ADAMTSL2 gene associated with Musladin-Lueke Syndrome has been identified in Beagle, although its overall frequency in this breed is unknown. Genetic testing of the ADAMTSL2 gene in Beagles will reliably determine whether a dog is a genetic Carrier of Musladin-Lueke Syndrome. 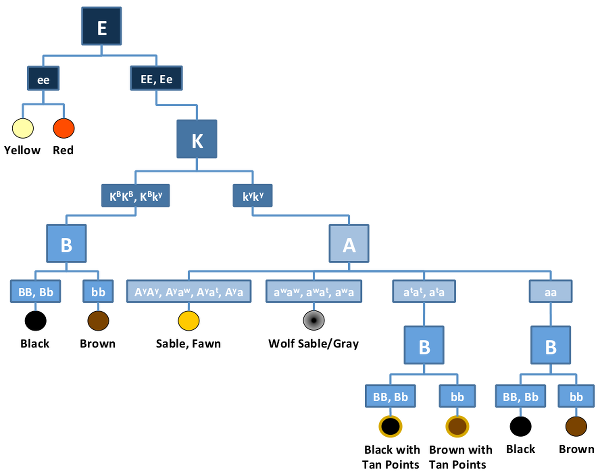 Musladin-Lueke Syndrome is inherited in an Autosomal Recessive manner in dogs meaning that they must receive two copies of the mutated gene (one from each parent) to develop the disease. In general, carrier dogs do not have features of the disease but when bred with another carrier of the same Mutation, there is a risk of having affected pups. Each pup that is born to this pairing has a 25% chance of inheriting the disease and a 50% chance of inheriting one copy and being a carrier of the ADAMTSL2 gene mutation. Reliable genetic testing is important for determining breeding practices. In order to eliminate this mutation from breeding lines and to avoid the potential of producing affected pups, breeding of known carriers to each other is not recommended. Beagles that are not carriers of the mutation have no increased risk of having affected pups.